Warning: As much as I try to avoid major spoilers in any review I write, including series books, sometimes it cannot be avoided. This is one of those instances. If you have not yet read the first book in the series, Mr. Churchill's Secretary, you may want to proceed with caution. No major spoilers are offered as to Princess Elizabeth's Spy. Maggie Hope had been hired as a typist for Prime Minister Churchill in Mr. Churchill's Secretary and unwittingly stumbles into a wasps nest of espionage and murder. Her actions and intellect land her a position with MI-5, Great Britain's domestic intelligence agency, and her first assignment is to protect and possibly uncover any plot that may involve the life and safety of Princess Elizabeth, the heiress to the throne. Maggie goes undercover as the princess's math tutor. 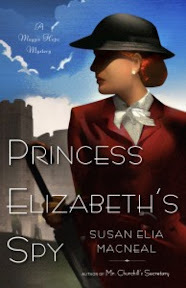 Princess Elizabeth's Spy isn't quite as intense as I found the first book in the series to be, but it was no less enjoyable. These books are on the lighter side despite the serious subject matter involved. There is an air of unbelievability the reader has to set aside, but isn't that often the case with these types of novels? The author is very respectful of the royal family and I enjoyed getting glimpse of what castle life might have been like for the young princesses during World War II. I admit I particularly enjoyed getting to know Princess Elizabeth and hearing about her budding romance with her future husband. I especially like the author's attention to detail, particularly in terms of the setting and time period she is writing about. She throws in little historical tidbits as well as time period details, which add a more authentic flare to the novel. MacNeal does take liberties with history for the sake of the story, but given the nature of the book, it's understandable. Like in the last book, there is murder and espionage. Maggie has her hands full and not a lot of clues to go off of initially. In the previous book, much of what happened occurred to or around Maggie. In this book, Maggie is much more directly involved in the investigation. It was good to see her in a more active role. Maggie is headstrong and stubborn like many heroines in mystery novels today. One aspect I liked about the role Maggie played in Princess Elizabeth's Spy was her imperfectness. She was on her first assignment for MI-5 and it showed. She is vulnerable to outside influences, such as personal issues going on at the same time, and had to be reminded to stay on task. This second book in the series was more straightforward in terms of plot, with fewer side stories taking place in the background. There are still plenty of twists, some predictable and some not so much. Maggie's own past--and that of her parents--is an ongoing story line that threads its way through the series and will be even more prominent in the upcoming third book from the sounds of it. I admit to being more than curious to see what direction Susan Elia MacNeal will take us. I hope you will check out what others had to say about Princess Elizabeth's Spy on the TLC Book Tours route! Many thanks to the TLC Book Tours for the opportunity to be a part of this book tour. Copy of Princess Elizabeth's Spy provided by publisher. My mother is fascinated with British royalty so I bet she'd love this series. Kathy - The first book didn't involve the royal family and I'm not sure about future books in the series, but I wouldn't be surprised if we see them again at some point. I haven't read the first book, so I just skimmed. I am glad that the second book was more direct and that you are looking forward to the next. I love the fact that Maggie was strong, but also vulnerable sometimes too. Very nice review today! Peppermint - It's a fun series. Not too serious, with just enough charm and mystery. I think this one looks like a fun read. I do have a weakness for royal stories (fiction and nonfiction). Alyce - I really like the main character. The royal family isn't fleshed out much in this book, but I don't know that it was necessary given the type of book and what it is about. I didn't read your review because of the spoiler alert and also because I JUST started Mr. Churchill's Secretary!!! Staci - I hope you enjoyed the first book in the series as much as I did! Ooh I think I'd really love this series! I admit I skimmed your review because I haven't read the first book yet and I don't want to spoil it. I'm really looking forward to it though! Heather J. - I think you'd like it too! I hope you get a chance to read them! I am on the fence about this series. I think the period and the cast of characters is fascinating but I am just not as drawn to it as I thought I would be - perhaps because it's an unfinished series! I DO love the covers for the two books that are already out, though! Aarti - The covers are very well done, aren't they? I like them too. I can understand your hesitation. The books do stand well on their own in terms of the main mystery, but I think much is lost by not reading them all. The personal "side" story is such a big part of the books. I love, love the covers of these so my interest was picqued from that - but I've skimmed enough of your review to know that the cover is only the beginning of the good stuff! I read the first two books (I'm on the tour as well http://manoflabook.com/wp/?p=6635), I liked this book better than the first and hoping that the third one will live up to the teaser at the end. Man of la Book - The third book sounds like it will be a good one, doesn't it? I wish we didn't have to wait so long for it to come out.